“You can’t sell on social media!” Usually that’s the reaction from people who haven’t been able to do it OR who feel it’s un-cool to promote yourself on the networks. The truth is you CAN sell using social media… all depends on how you use it. • Moving from community to conversation to the cash register! • What results can you expect? • Best practices for selling on social media. • Advertising possibilities and pitfalls. Your presenter, Heidi Thorne of Thorne Communications LLC, has been able to leverage her social media activities into cash in the bank business for her company which primarily serves B2B clients. Her presentation will offer practical tips for doing business on social media. She brings over 25 years of experience in the fields of advertising, marketing, sales and public relations to this program, including a decade in the trade show and hospitality industries. 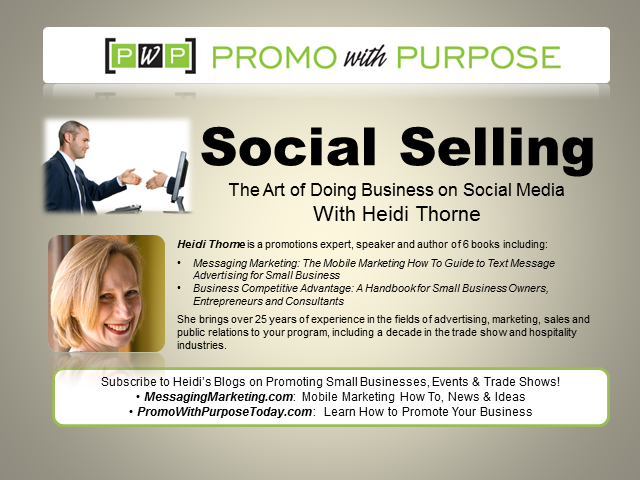 Heidi is also the editor and founder of PromoWithPurposeToday.com (how to promote your company) and MessagingMarketing.com (social media and mobile marketing how to) blogs.